"a bi-monthly journal of environmental news and commentary..."
Thurston County is home to over 17 school gardens, ranging in size and age from Lincoln Elementary School's quarter-acre, 16 year-old garden, to Meadows Elementary School's four beds and small greenhouse established last June, to Nova Middle School's just-dedicated twelve-bed garden. While these gardens vary in size, age, and organizational structure, they have much in common. These school gardens teach kids how to grow their own food, encourage nutritious eating habits, provide students with outdoor exercise, create and nurture community, and develop environmental stewardship. The lessons students learn through school garden programs are invaluable and life-long. For a school garden program to truly thrive, however, requires the collaborative efforts of many individuals and organizations. The more collaborators, the more robust the garden program, and the richer the experience for all involved. One local example of how a multitude of partnerships can create and sustain a rich school garden program is the Madison-Avanti Giving Garden. 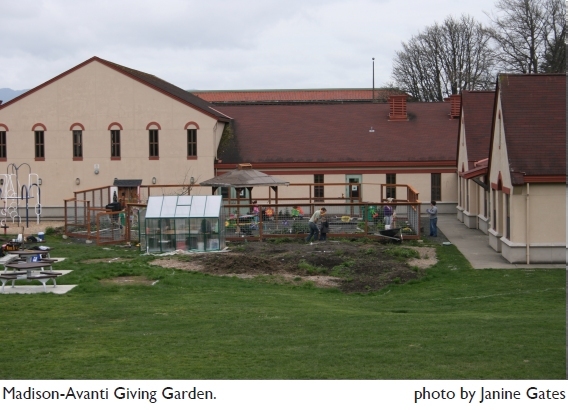 The Madison-Avanti Giving Garden (MAGG) was established just over a year ago by the students, educators, and parents at Madison Elementary School and Avanti High School; the Eastside neighborhood community; and Garden-Raised Bounty (GRuB). These same groups have helped sustain a thriving garden program, with additional support from the Thurston County Food Bank and interns from the Evergreen State College. Every Thursday afternoon, the garden hosts classes where Avanti students mentor Madison students in garden education. Together, Madison and Avanti students have learned about worms, composting, and seeds, and have kept the garden maintained and planted over the past year. Dedicated parent volunteers coordinate and manage the Thursday garden sessions, an Avanti staff member oversees the Avanti students' commitment, and staff at Madison Elementary work the garden time into their schedule, and make room for the classes indoors when the weather is too cold or wet to have the classes in the garden. Another piece of the garden program is the MAGG's Farmstand Fridays. On six Fridays throughout the school year, Madison students are invited to "purchase" produce from the MAGG farmstand using tokens they earn through environmentally-friendly behaviors such as emptying recycling containers and turning off lights when they leave a classroom. The Thurston County Food Bank (TCFB) procures the produce, which is sourced from local farms whenever possible, and mirrors the produce being grown and learned about by students in the garden. Each student at the school goes home with three produce items they have selected from the six available each farmstand. TCFB pays for the produce that goes home with the students who participate in the Free and Reduced Lunch program (currently about 62%), and MAGG fundraises to pay for the balance of the produce. In this way, the Food Bank meets it's goal of providing fresh, nutritious produce to their school-age clients, and the Madison-Avanti Giving Garden enables all students to benefit from this nutrition education opportunity. The farmstands are staffed by TCFB staff and volunteers, Avanti students, and Madison parents. In conjunction with the farmstand, one dedicated parent coordinates classroom cooking lessons, allowing entire classes to create a nutritious dish together, using produce that will be available at the upcoming farmstand. Students have recently enjoyed cooking and devouring healthy treats such as borsht, coleslaw, and vegetable fried rice! Students receive recipe cards with their farmstand purchase, so they can help prepare meals for their family at home. Both Madison Elementary and TCFB provide produce and recipe ideas for the cooking lessons, and parent volunteers act as guest chefs. More garden-based education happens through a lunchtime/recess garden program developed by Evergreen State College interns and volunteers. Four days a week, small groups of Madison students sign up to eat their lunch in the garden with TESC students, while participating in a garden education activity. Activities have included a "sunflower fantasy," in which kids visualized the life cycle of a sunflower from seed to seed, and discussions about the amount of water used in food processing. Students gain knowledge and insights in these informal lessons, but the benefits go beyond that: The simple act of spending time outdoors in a garden encourages observation of and reverence for the natural world, and provides a welcome respite from students' classroom environments. The Madison-Avanti Giving Garden clearly benefits Madison Elementary School students and Avanti High School students in myriad ways. It also greatly benefits each of the individuals and organizations that make it work. We all use the garden to achieve some of our programmatic or personal goals, but we benefit even more from the rich synergy and community that the garden has engendered. Hopefully, this article has inspired you to consider how you, as an individual or a member of an organization, might get involved in your local school's garden, nourishing students, nourishing plants, and nourishing your spirit. For even more inspiration, we invite you to observe the last Farmstand Friday of this school year on June 3, between 12:30 and 3:00. Please sign in at the Madison office before proceeding to the garden. Karen Ray is the School Gardens Program Manager for the Thurston County Food Bank (schoolgardens@thurstoncountyfoodbank.org). Katie Stoll is the Garden Coordinator for the Madison-Avanti Giving Garden.